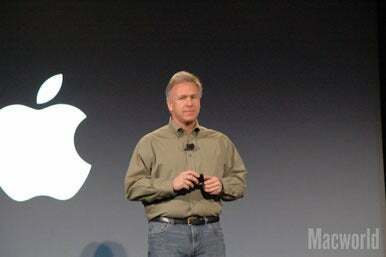 Apple's Phil Schiller at the event on Thursday. Apple announced a pair of education initiatives Thursday that the company hopes will take its iPad to the head of the class. Speaking at a press event at New York’s Solomon R. Guggenheim Museum, Apple executives showed off a new version of the iBooks e-reader app optimized for electronic textbooks as well as iBooks Author, a Mac program that can build those textbooks. In addition, Apple is taking its successful iTunes U lecture series and turning it into a mobile app aimed at including a complete set of course materials, not just lectures. To that end, Apple outlined two initiatives on Thursday, aimed at reinventing both textbooks and curriculum. Not coincidentally, those initiatives center around Apple’s iOS devices, with particular attention paid to the iPad. Apple has always enjoyed a strong foothold in the education market, dating back to the days of the Apple II. While the company’s education efforts took a hit in the 1990s as Apple struggled as a business, it’s regained its footing in recent years, with the iPad representing a new opportunity for Apple to bring its products into the classroom. During Thursday’s event, Schiller noted that there are more than 1.5 million iPads in use at educational institutions. The way Apple sees it, iPads provide a way to get students excited about learning by delivering educational content in an engaging way. That’s the thinking behind Apple’s push to reinvent textbooks. And that gives the iPad an edge over traditional printed textbooks, according to Schiller. The iPad is more portable than a thick textbook; you can store multiple textbooks on a single device. What’s more, digital textbooks can be updated, easily searched, and include interactive multimedia that simply can’t translate to the printed page. “Kids are going to love to learn with textbooks in iBooks,” Schiller said. In iBooks 2, readers can tap and zoom on any content, swipe between pages, browse thumbnails, and search for specific terms and page numbers via a dedicated search feature. The app also includes highlighting and notation capabilities, as well as a Study Card feature that converts highlighted text and notes into flash cards. As part of the iBooks 2 update, Apple expanded its online iBookstore to include a textbooks section. As of Thursday morning, only eight books were available for download, but Apple expects that volume to increase. Schiller says that Apple has gotten a “ton of advice” from educational publishers, including Pearson, McGraw Hill, and Houghton Mifflin Harcourt. Those three companies account for about 90 percent of the textbooks sold in the U.S., according to Schiller. 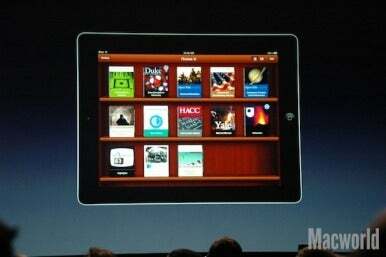 Pearson and McGraw Hill are the most visible players in the iBookstore’s Textbooks section at launch. Pearson is currently selling books on biology and environmental science, with algebra and geometry offerings on the way. McGraw Hill’s available textbooks cover algebra, geometry, chemistry, biology, and physics. Schiller also promised books from DK Publishing aimed at elementary-school aged kids. Three DK books are currently available on the iBookstore, in a different section from the high-school textbooks. 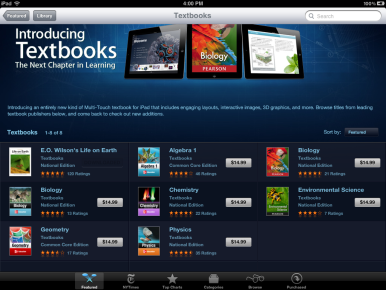 Apple says that textbooks will sell for $15 or less in the iBookstore. It didn’t specify how it would split revenue with textbook publishers. In other areas of the company’s electronic retail empire, however, Apple takes a 30 percent cut of magazine subscriptions and apps sold through its App Store; publishers and developers keep the rest. 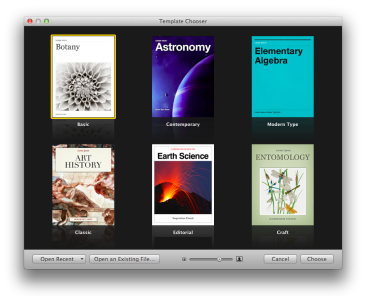 iBooks Author comes with several textbook-themed templates. 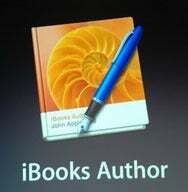 To encourage others to bring electronic textbooks to the iBookstore, Apple also introduced iBooks Author on Thursday. The free Mac app—available from Apple’s Mac App Store—is a WYSIWYG editor for creating digital textbooks with interactive elements (though Schiller pointed out Thursday that other publishers could take advantage of the app’s book creation tools, too). Mirroring the interface of Apple’s iWork apps, iBooks Author lets users import text from Pages or Microsoft Word; they can also insert interactive Keynote presentations and movies into documents. Widgets assist in the creation of image galleries, and other tools can add glossaries or connections to Internet databases. A live preview option allows publishers to see what the final product looks like on an iPad. “It’s easy to use, powerful, feature-rich, and authors will love using it,” Schiller said of iBooks Author. iBooks Author aids in the uploading of books to Apple’s website for submission to the iBookstore. Files are output in a special iBooks format that does not appear to be compatible with any other ebook reading platforms, and Apple’s licensing rules specify that the files created in iBooks Author can’t be sold anywhere but on the iBookstore. While much of Thursday’s presentation centered on Apple’s push for interactive textbooks, the company also outlined goals for reinventing classroom curriculums. The driving force behind that will be iTunes U, a free service that Apple hosts which distributes lectures and other educational content. According to Apple senior vice present of Internet software and services Eddy Cue, more than 1000 universities use iTunes U to serve up lectures; the service has logged 700 million downloads since its launch four years ago. Apple wants iTunes U to be about more than lectures, however; to that end, it launched a free iTunes U app aimed at managing other course material via an iOS device. The iTunes U app offers full online courses, including the course syllabus, interactive material, reading material, and more. Students will be able to grab relevant texts from the iBookstore or download class videos to watch on their iPhone or iPad. It “lets teachers and students do everything they need with an app,” Cue said. Teachers interested in distributing courses through iTunes U have several Web-based resources at their disposal courtesy of Apple. In addition to support forums, Apple offers the Web-based iTunes U Course Manager for step-by-step instructions on creating materials to be distributed via the iTunes U app. Choose a template: The iBooks Author templates are all education-themed, though easily customizable. As executives were outlining Apple’s education initiatives Thursday morning, the company also took care of a little housekeeping, in the form of an iTunes update that lets users sync newly available interactive textbooks between their computer and iPad. Thursday’s introduction of iBooks 2 during Apple's education-centric press event introduced multimedia-rich books that feature images, databases, videos and 3D models alongside traditional text. Those books are now available from a new Textbooks section of Apple’s iBookstore. iTunes 10.5.3, also released Thursday, allows users to download those books from the iTunes Store on a Mac or directly from the iBookstore on an iPad, syncing them to the Apple tablet. In addition to the updated Mac version of iTunes, Apple released a similar update for Windows Vista and Windows 7 users. At Thursday’s education-themed Apple event at the Guggenheim museum, Apple executives Phil Schiller and Roger Rosen were on hand to introduce iBooks 2, which heads the first of two education initiatives unveiled by the company. Phil Schiller shows off iBooks 2 Thursday in New York. More specifically, it stacks up better with iBooks 2, which brings fullscreen textbooks with interactive animations, diagrams, photos, and videos to students and teachers. Apple vice president of productivity software Roger Rosner took to the stage to demonstrate the app’s new features for textbooks, which include a revised index for easier search, page thumbnails, virtual study cards, interactive multiple choice questions for section and book quizzes, and new portrait and landscape views. Apple on Thursday launched iBooks Author, a free Mac app designed to let authors and publishers easily create multimedia-rich e-textbooks for the company's updated iBooks 2 app for the iPad. iBooks Author was demonstrated Thursday in New York. The app itself is a WYSIWYG editor with a user interface similar to Apple's iWork product line, which includes Pages, Keynote, and Numbers. Text can be dragged directly from Pages or Microsoft Word into the editor; the app uses the document’s styles to automatically create sections, headers, and layout. Keynote presentations can also be automatically inserted into textbooks, giving the final document more interactivity than a traditional publication. Images can also be dragged into the text; iBooks Author uses live alignment guides to flow text around the picture as it is placed in the correct spot. A Multi-Touch widgets feature allows users to create image galleries that can also be dragged into the book, then easily resized; the widgets also let users add movies and 3D objects to the pages. The app can also connect to Internet databases to present numerical information without cutting-and-pasting. Against my better judgment, I let myself get swept up by the wave of e-publishing rumors in the days leading up to Apple’s education-themed announcement. Apple could do it, I thought to myself. The company had both the resources to build a great tool, and the reasons to do so. The application Apple did release, iBooks Author, is impressive in some ways. It’s free. Textbook publishers, teachers, comic artists, and others seeking an easy way to make rich, fixed-format iPad books should be thrilled. As Macworld editorial director Jason Snell points out, it will save a lot of people from having to create a dedicated app just to serve beautiful versions of their content. But there are perhaps just as many caveats and concerns with Apple’s new application. The iBooks Author end user licensing agreement is vague and worrisome. Like every program that came before iBooks Author, you can’t edit ePubs directly; unlike programs such as Scrivener, Pages, and InDesign, however, this app’s only purpose is to make books. And to top it all off, it won’t even export the open ePub format Apple has long championed; instead, it makes proprietary .ibooks files. Sure, iBooks Author is only version 1.0—and seeing as how I’ve defended Apple in the past for features missing from its 1.0 software, I probably should withhold my judgement for the time being. But I can’t help but be disappointed. The iPad has begun a quiet revolution in education. All over the world, schools are putting ambitious plans in place to adopt Apple’s tablet at large scale. When parents, teachers and administrators are surveyed, converting textbooks into electronic publications is often one of the main purposes that respondents imagine an iPad in school could be used for. It’s usually the parents and school administrators who are most enthusiastic about this—students and teachers often have more imagination! Before Thursday’s announcements, the situation for using ebooks in schools was dire. Neither of the Big Two ebook systems—iBooks and Kindle—had any mechanism for a school to build an “ebook library.” Unfortunately, we still don’t. 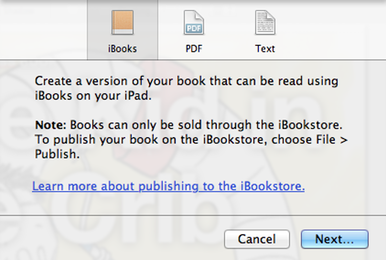 If you want to sell the iBooks Author-created books you build, your only option to do so is through the iBookstore. You retain the right to freely give away your books elsewhere, but the End-User License Agreement (EULA) says that if you want to sell iBooks Author-created ebooks, you must go through Apple—and thus cut Apple in on any money you make selling your works. I’d like Apple to explain its justification for this policy. I understand the argument that Apple is giving away the app for free, and thus deserves to find a way to profit from it. But Apple gives away GarageBand with every new Mac, and doesn’t require that you only sell the songs you create with that app through the iTunes Music Store. I’ve written a book in Apple’s $20 Pages app and didn’t need to cut Cupertino a check for a single cent of my advance or royalties. Could I pay Apple $20 for iBooks Author and then have permission to sell my book wherever I’d like? I had to check that my computer wasn’t an old black-and-white television set showing blocky white text Thursday morning and that I wasn’t clacking away on a 6502 computer over a 110-baud modem when I heard about Apple’s announcements relating to iBooks 2, iBooks Author, and its new multimedia textbooks. That’s because I’ve heard it all before. From the dawn of the concept of multimedia, firms that cater to the education market have been pushing the notion that adding animation, audio, and video (as each form of media became more readily embeddable) would engage students further, and improve achievement. Printed books are boring. They just sit there! That’s one of their advantages, too. At Apple’s press event on Thursday, senior vice president of worldwide marketing Phil Schiller went down the same tired path. “One thing we hear louder than anything else is student engagement, inspiring kids to want to discover and learn,” he said. Kids are bored. The iPad is fun and engaging, Schiller explained. This is the same contention made for decades, and I challenge readers to find any longitudinal studies tracking students who have used or are using packaged multimedia-enhanced instruction showed measured and consistent improvement over control groups.